Quite possibly the most beautiful car Jaguar ever produced. 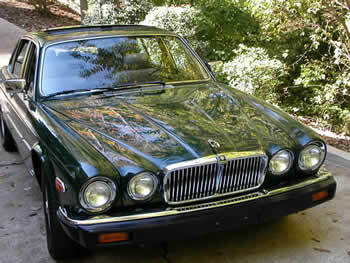 The Jaguar Series III XJ6, produced from 1979 to 1987 (up to 1992 in the XJ12 version) was a redesign of the Series II. Italian design house Pininfarina was retained to update the design of the Series II, and succeeded very well. Offered in the base, Sovereign and Vanden Plas models, the Series III came to represent everything that was "Jaguar". The Series III retained the 4.2 liter six cylinder/BW66 combination used in the earlier series. The 5.3 liter V12/Turbo 400 combination was available outside the United States. Jaguar was not able to offer the car in the U.S., as the company couldn't meet CAFE standards with two V12-powered cars in the lineup. Horsepower figures for the XK dual overhead cam 4.2 varied greatly. Some differences were due to differing configurations between models, and some were due to the changes in horsepower calculations and reporting. The U.S. spec engine was rated at near 170 net horsepower. This power was channelled through the Borg Warner 65/66 automatic transmission, then through the independent rear suspension to the rear wheels. The primary (and possibly the only) difference between the Borg Warner 65 and 66 was a straight-cut first gear. The model 65 has a noticeable whine when starting off in first gear. The IRS unit was equipped with inboard brakes, with the brake rotors mounted to the output shaft of the differential. This produced noticeable better handling and ride, but increased the service difficulty somewhat. The new features introduced since the Series II were thicker rubber bumpers, door handles that were flush to the door, a vertical grill, narrower door frames with the option of a sunroof and cruise control. The flat gauges and flat dash panel were also replaced with a more contemporary instrument cluster. Announced early in 1986, the successor to this car was the XJ40, or Series IV, XJ6. Although the two cars shared the "XJ6" name, there are only two or three parts common to the two cars. We have the most accurate Jaguar parts catalogs on the internet so that you are able to find the correct part for your car every time. Check out our complete line of new and used parts for the Series III XJ6.